This is a technique that I cam up with when someone posted a "how is this done?" photo. 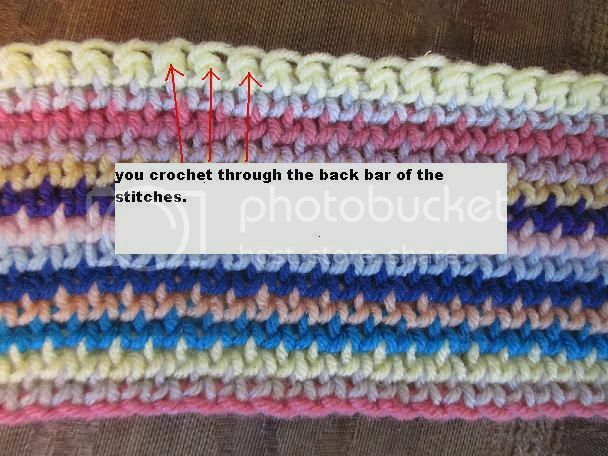 This is crochet through the back bar of the stitch and it is always worked with the right side of the fabric facing you. 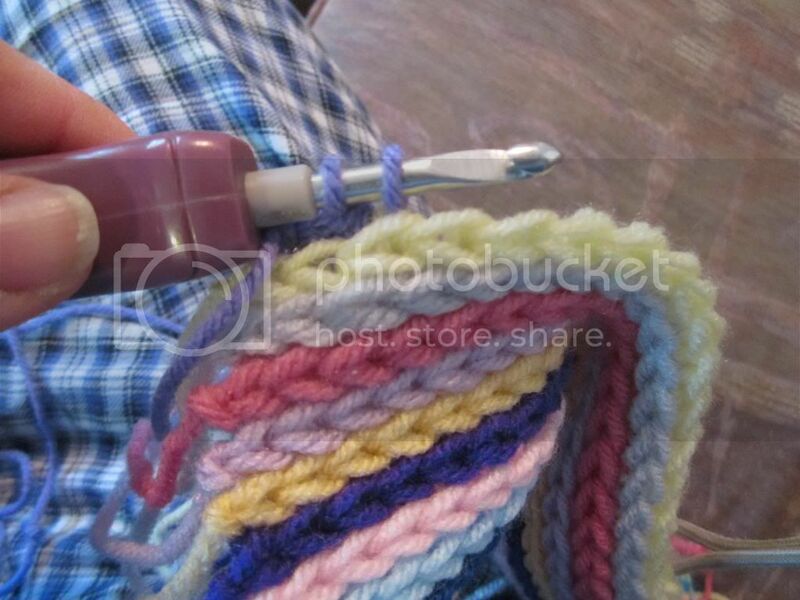 When working this flat, you work 1 row and break your yarn and return to the beginning to start the next row new. 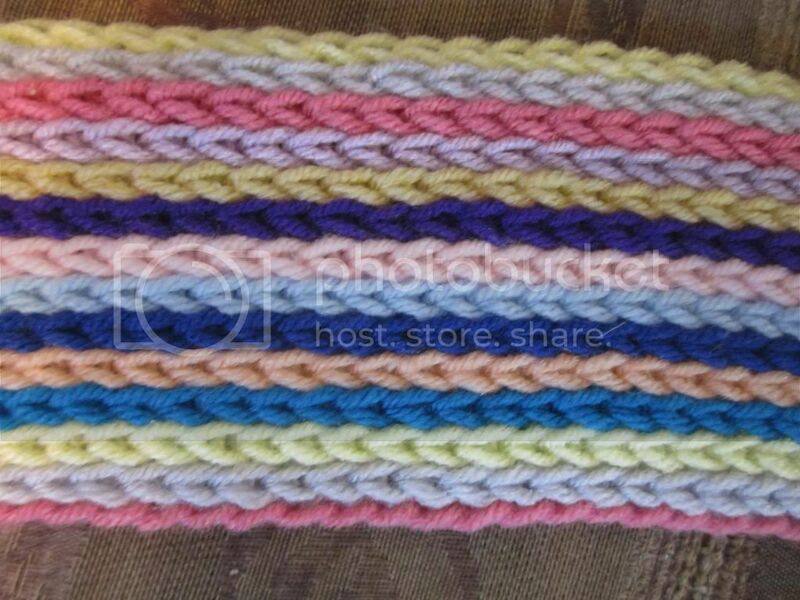 By working through the back bar of the stitch you are pushing forward the top edge which leaves the right side of the fabric showing the braided edge of each row. This also results in a denser fabric. I recommend using a larger hook and a non splitty yarn to be sure you can get your hook into the back bar of the stitch. For the initial chain I worked it with a hook 2 sizes larger than the one I did the work with to help eliminating a tight edge. This also will bias hugely as it's worked all from the right side. There are ways to counter this effect and I will mention them later. Due to the tails on each side, this is also a great fabric to add fringe to, especially if you are working each row in a different color. This makes a nice fabric for a place mat, or a unique texture for a scarf. 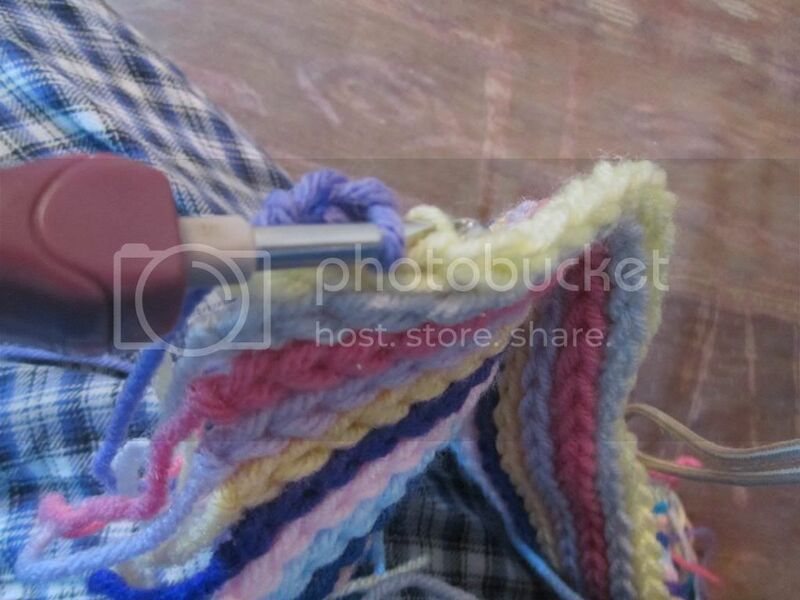 You can work it in the round to create a unique striped edging for a blanket. this is the fabric from the back. You can click on the images to enlarge them. To start, chain a desired amount for the length you wish to make. Use a hook 2 sizes larger than your working hook to make sure your starting chain does not get to tight while working into the stitches. 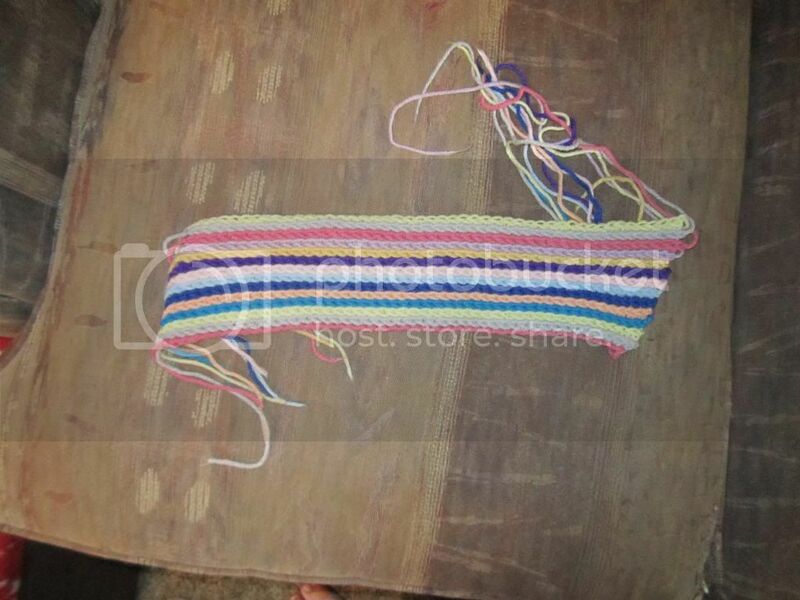 * I always prefer to work my 1st row of any project through the back bumps of the chain. This creates a nice edge. 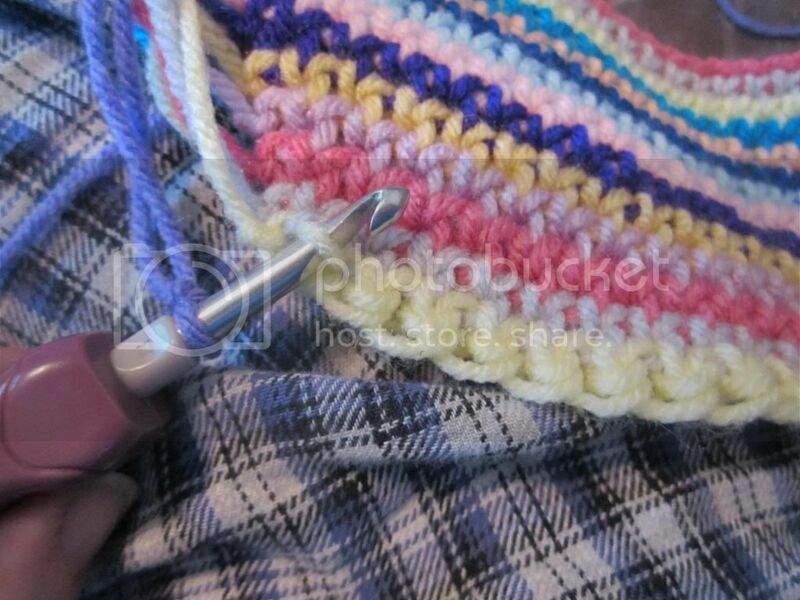 After this point you will always have the right side facing and you will be crocheting into the back bars of the stitches. 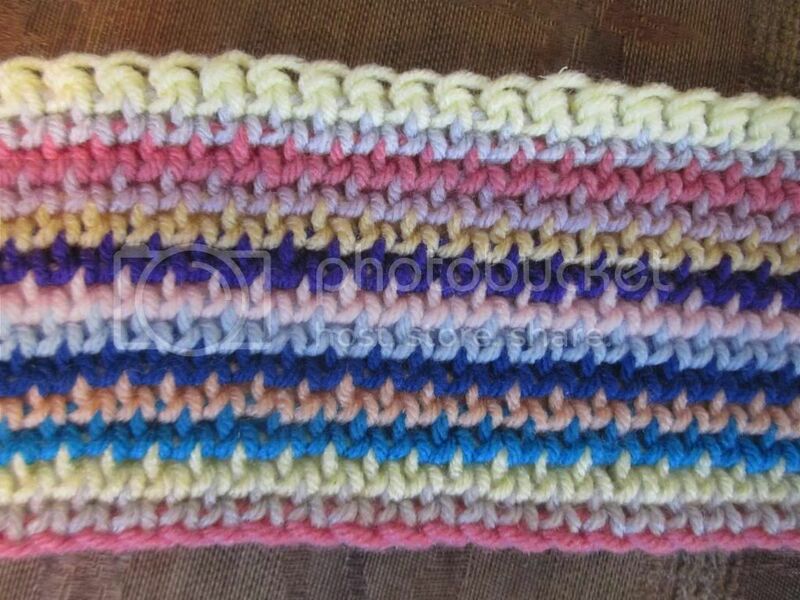 Return to the start and join with a single crochet into the back bar of your 1st stitch. yo and draw through loop and slip knot on hook. Continue working accross the row working 1 sc into the back bar of each stitch on the previous row. 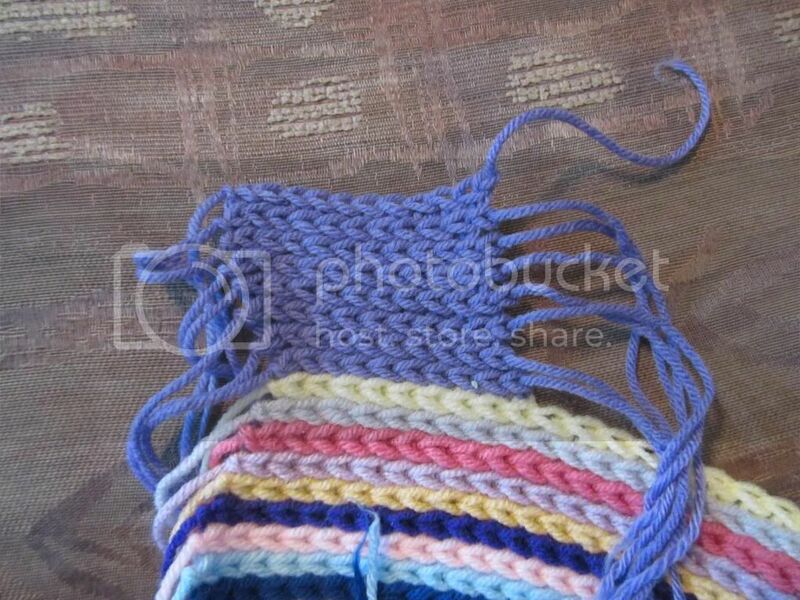 When you reach the end the last stitch can be hard to see. This one is a bit harder to see because i left my ends loose. Working every row as stated above will result in a fabric that slants on both sides. 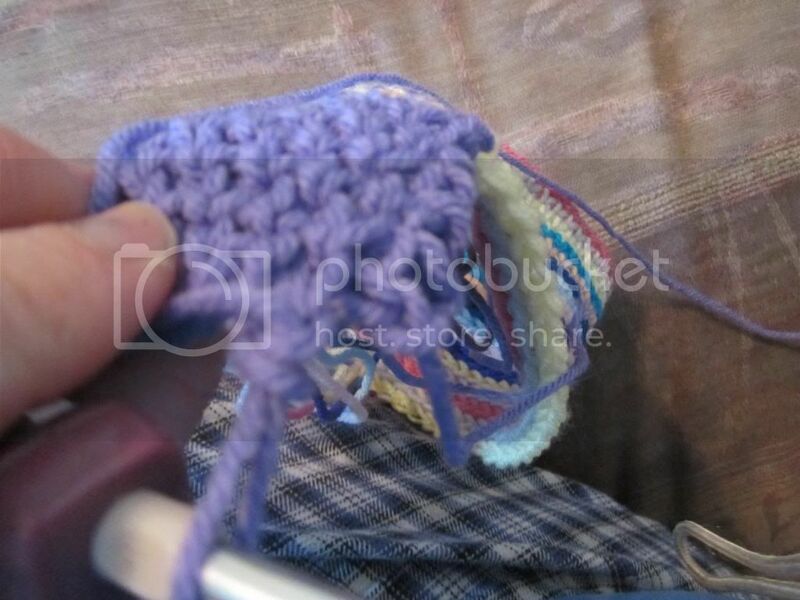 This is just the nature of this stitch. 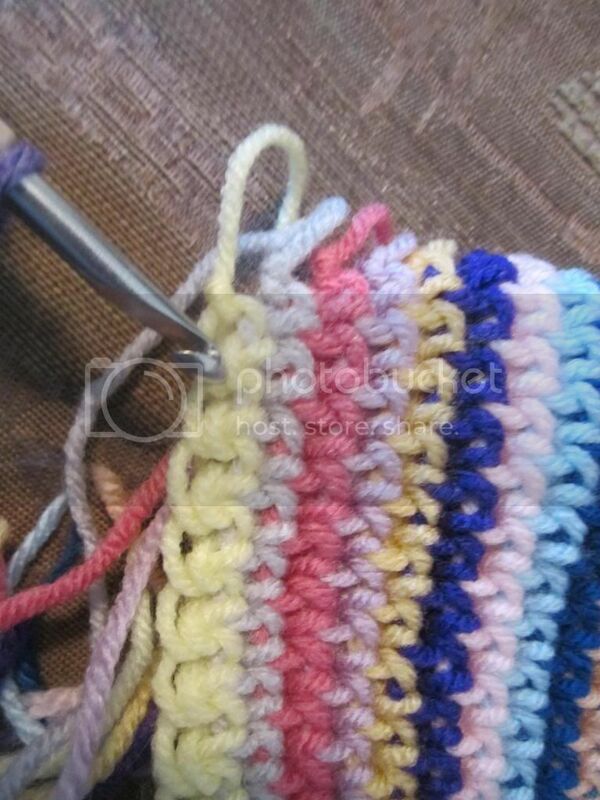 If you wish to minimize this effect or shape the bottom differently, you can work 2 sc into the 1st bar of the row and on the last 2 stitches sc them together (insert hook into next stitch, yo draw up a loop, insert hook into last stitch yo and draw up a loop, yo and draw through 3 loops on hook). doing this on every row will result in the fabric slanting the opposite way. Alternating every 5 rows or so between regular and the shifted rows will result in a edge that has points. To make the edges more straight. work one row regular, stitch for stitch to the end. and work the next row with the sc2 in 1st bar and sc2tog in last 2 bars. this will help keep the edges in a straighter line. On the 1st 3 rows of the pruple here, I have worked them as the shifted rows starting with 2sc in 1st bar. you can see the slant is gong the oposite way as the edg in the fabric below the purple. the rest of the purple is worked alternating rows which has caused a straighter edge. Interesting. Thanks for showing this technique.